The 2011 Buick LaCrosse offers efficiency, comfort and style with a responsive driving experience. Completely redesigned for 2010, this latest LaCrosse is distinguished by its fresh styling. The 2011 LaCrosse features a new four-cylinder engine, GM's Ecotec 2.4-liter direct-injection four-cylinder engine and a 6-speed automatic transmission. Fuel economy is an EPA-estimated 19/30 mpg City/Highway. The Ecotec engine replaces a 3.0-liter V6 that came standard on 2010 models. A 3.6-liter V6 is available for all models offering 280 horsepower and an EPA-estimated 17/27 mpg City/Highway. The sporty LaCrosse CXS comes exclusively with the 3.6-liter V6, along with a host of features and options designed to enhance its sporty character, yet it retains comfortable driving characteristics and the same fuel economy rating. Completely redesigned for the 2010 model year, the LaCrosse looks contemporary, elegant and refined. It's conservative but not conventional. There's an edge to it. It's a fresh take on traditional Buick design, but it includes Buick heritage cues, such as the waterfall front grille and the signature portholes. The portholes, however, have been moved from the traditional fender placement to the hood so as not to disturb the fluid body lines. The result is a sweeping, fluid exterior design that flows uninterrupted around the vehicle, with no disconnected lines. The interior has a finely detailed, high-quality character. The more you look, the more you see. Throughout the cabin are few straight lines and 90-degree joints, if any. Instead, surfaces and controls are rounded, coved, or arched. Real stitching is used to join seams of the seats, shifter boot and soft material used on the door panels and around the instruments. Chrome and wood trim are used judiciously, tastefully, and the materials in the headliner and upper parts of the cabin look and feel like premium material. Features like remote starting, rear-seat DVD and ice-blue LED interior lighting accents are available, along with in-dash navigation, heads-up display, Bluetooth, and auxiliary audio input with USB port. OnStar's automatic crash response and StabiliTrak electronic stability control headline a full complement of active and passive safety features. All-wheel drive is available, improving capability in winter weather. We found the LaCrosse relaxing to drive yet it will respond eagerly to driver input. The smooth ride of the current models is a big improvement over the pre-2010 models. Buick engineers working in Germany stiffened the body structure beginning with the 2010 models; a stiff structure is the key to a quiet cabin and smooth ride. Buick also improved the suspension starting with the 2010 models, and we found this latest version exhibits less body roll in the corners and less float on lumpy surfaces. The LaCrosse also offers continuously variable smart shocks, which adjust themselves in real time. Steering was quickened to complement the new chassis, so it steers more precisely, but without inducing noticeable torque steer under hard throttle. Adding to the feeling of security are four-wheel disc brakes that seem better proportioned, with better feel at the top of the pedal, than any GM brake system we can recall. All of this makes the LaCrosse a compelling choice. The LaCrosse can be configured for a wide range of customer priorities. Each model is specifically developed and tuned to emphasize qualities such as sport driving, road isolation, high mileage, or enhanced luxury. Even so, all models have a high level of standard equipment, and most safety equipment is standard on all models. 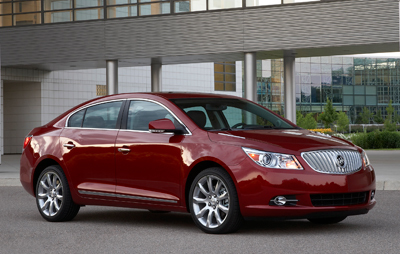 The 2011 Buick LaCrosse comes in three grades: CX ($26,495), CXL ($29,055), CXL AWD ($32,570), and CXS ($33,265). The front-wheel-drive CX and CXL come with the 2.4-liter four-cylinder engine. A 3.6-liter V6 is optional ($1,370) in the CX and front-drive CXL, and standard with all-wheel drive and on the CXS. LaCrosse CX comes standard with premium cloth upholstery, automatic air conditioning, AM/FM/XM/CD/MP3, OnStar Safe & Sound, remote keyless entry with extended range, programmable power door locks, power windows, tilt/telescoping steering wheel, heated outside mirrors, and 17-inch steel wheels. LaCrosse CXL upgrades with leather heated seats, dual-zone automatic climate control, fog lamps, outside rearview mirrors with puddle lamps and turn-signal indicators, and 18-inch alloy wheels. LaCrosse CXL AWD ($32,570) adds an intelligent all-wheel-drive system paired with a more sophisticated H-arm rear suspension and the 3.6-liter V6. LaCrosse CXS features the 3.6-liter V6 and includes leather heated and cooled seats. Chrome plated 18-inch wheels are standard; 19-inch wheels are optional ($2,745). An optional H-arm suspension touring package ($800) is available on CXS, which includes real-time damping and sport mode selectivity; 19-inch wheels; and lower-profile, higher grip tires. Safety features StabiliTrak electronic stability control, traction control, four-channel ABS, Electronic Brake force Distribution and Brake Assist. There are air bags for driver and passenger at front, side, and thorax, plus head-level side curtain air bags for all rows. This is all standard equipment on all models, as are pedestrian protective features. OnStar, with automatic crash response, comes free for a year. Rear seat-mounted thorax air bags are optional ($350) on all models. Optional all-wheel drive can further enhance safety. The LaCrosse comes with well-designed seat belts, which are your first line of defense in an accident. There is a definite international look to the Buick LaCrosse, in part because it's intended to look at home in Asian markets and overseas settings. It's distinctly original, and yet, the car remains recognizable as a Buick. There is a notably high belt line, and the wheels are snugly enclosed at the outer ends of the body. Viewed from the side, the profile is not unlike that of a sport-compact coupe, but the LaCrosse is a roomy car, and bigger than it looks. A coefficient of drag (Cd) of 0.33 adds to the sleek effect and helps improve mileage and control wind noise. Teams on three continents participated in the design. The chassis team, based in Germany, adapted a version of the FWD/AWD platform developed for the Opel Insignia, and the interior was designed in China. The exterior design team, based in North America, took on the responsibility for creating a fresh, new Buick sheetmetal treatment. The LaCrosse interior uses thoughtfully considered materials, based on a highly detailed design concept. The front space is framed by a low-and-away instrument panel, opening up the area for front seat occupants and creating a light, airy atmosphere. Flat, low-relief controls are clustered in an orderly, symmetrical center stack, leaving generous portions of the dash surround free and clean. The overall effect is to create a graceful, uncluttered cockpit. Styled air vents on either side of the navigation screen, which mimic the design of vintage Buicks, have a quality feel and ample range of adjustment. At dusk, ice-blue ambient lighting becomes apparent on CXS models, with LED sources located around the audio controls, along the instrument panel and in the footwells. Two overhead spotlights softly highlight the seating areas. It's a visually sophisticated way of lighting the cabin, quite unexpected and inviting. The interior design team was based in China, where Buick cars are often purchased by owners who do not drive themselves, leading to special emphasis on interior detail and back seat accommodations. Rear legroom is generous, even with the front seats adjusted for taller drivers. The rear seat offers its own climate control system, and a seat-back-mounted DVD system is optional. A power rear sunshade is standard on the CXS. All models benefit from Buick's QuietTuning sound control initiatives. These include use of acoustic glass, triple door seals, acoustic mats and extensive use of sound-deadening materials. Engine and suspension noise and vibrations have been isolated through use of hydraulic bushings, covers and tuned air flow systems. LaCrosse CX and CXL models are complemented with dark poplar wood appliques, while the CXS has more technical titanium-type square trim details. Interior color choices include contrasting two-tone combinations: Cocoa/Light Cashmere and Dark Titanium/Light Titanium as well as (on leather-equipped models) solid Ebony. We drove a LaCrosse CXS with the touring package, plus the head-up display, navigation system, and heated and cooled leather seats. The 3.6-liter V6 allows for easy loafing about, even under 2000 rpm, and quickly revs to 7000 rpm when the throttle is pinned to the floor. When passing, we saw the automatic transmission shift directly from 2000 rpm to 5000 rpm, on the way to 7000 rpm, accelerating smoothly. That meant we were exposed to oncoming traffic for a minimum amount of time. The engine does need to rev to make peak power, seeming to catch fire at 4500 rpm. It makes a pleasantly balanced, muted mechanical whir when revved, but otherwise runs very quietly. The 3.6-liter V6 is rated at 280 hp and 259 lb-ft torque, and gets an EPA-estimated 17/27 mpg. The 2.4-liter Ecotec boasts variable valve timing and direct fuel injection, just like the big V6, and is rated 182 hp at 6700 rpm, and 172 lb-ft of torque at 4900 rpm. Fuel economy is an EPA-estimated 19/30 mpg City/Highway. All LaCrosse models come with a 6-speed automatic transmission, although gear ratios differ slightly. The 6-speed is a key component to the responsiveness of the LaCrosse. It's intelligent, smooth shifting, and it makes the engines more responsive. Driven as an automatic, the transmission is a gem. If you prefer to select a gear on your own, it will allow manual shifts. We were impressed with the transmission. We found using the Sport mode and shifting manually is hampered by the location of the shifter, which is relatively far back in the center console. It was hard on our wrist to maintain grip on the shifter, which tells us the LaCrosse wasn't really designed for people who have to shift and downshift every gear on their own. Our preference was to put it in Drive and let the automatic take its cues from our throttle input. The hydraulically assisted, variable-ratio steering that comes with V6 models is surprisingly neutral, especially considering the front-wheel-drive layout, and pleasingly quick and precise. There are only 2.75 turns, lock-to-lock, and yet the car never feels twitchy on the road. The system has variable assist programming, so it gave us a firm, controlled feeling at speed and very light effort when parking. Four-cylinder models come with an electric steering system with the same fast variable ratios. We saw no apparent torque steer in normal driving, just a strong return-to-center tendency. In hard cornering at full throttle we saw the steering pull slightly to the left. In short, the Buick LaCrosse handles very well. We found that when driven hard, the LaCrosse CXS with the touring package gripped the road well and felt solid and controlled. The touring package includes the best handling components, such as H-arm rear suspension, 19-inch wheels, and continuously variable real-time damping. With this equipment, a very favorable ride/handling tradeoff has been achieved. Relaxed driving on choppy roads reveals a high degree of cabin isolation from the pavement. It's the kind of ride quality intended to provide superior comfort on long, straight roads that run between endless cornfields, or at higher speeds on the interstate. We could hear tire deflection as we passed over cracked tarmac, but we did not feel anything annoying. The driving was quiet, smooth and relaxed, and yet, the car does not float or wander. The chassis is still connected with the road, conveying a definite sense of control and agility. The brakes are impressive both in terms of pedal effort and overall feel. The system uses 12.6 inch front discs and 12.4 inch read discs, with aluminum calipers on all four corners. They offer gentle stopping at the very top of the pedal, making it possible to bleed in braking gently, for smooth, progressive stops. As we look back on GM braking systems of the past, which had good stopping power but poor pedal feel, we are all the more satisfied with this improvement. Every car should have brakes this good. There has been a focused effort at noise control in the LaCrosse, with mostly excellent results. Buick engineers have clearly studied sources of noise, then systematically damped, cancelled, or isolated those sources using materials like acoustic glass, liquid and fabric sound deadeners, engineered seals and tuned mounting systems. The car runs quietly to begin with, given the gentle nature of the V6 engine and tall overall gearing that permits low-rpm operation. But these sound control efforts have definitely bourn fruit, as the LaCrosse has a sound level measured at a quiet 35.5 decibels at 70 mph. We're not sure how that compares with the competition, which is also achieving remarkable noise suppression, but we can tell you that during our drive time, the loudest noise in the cabin came from the air conditioning fan. Recent history suggests Buick might not have made the short list among buyers who insist on original design, attention to detail, world-class chassis and drivetrain components, and advanced driving dynamics. But the current Buick LaCrosse is an attractive, advanced sedan with all those qualities. Based on what we see, those who take the time to shop Buick LaCrosse will be quite pleasantly surprised. John Stewart filed this report to NewCarTestDrive.com after his test drive of LaCrosse CXS and CXL models in Ann Arbor, Michigan. Head/hip/leg room, f: 38.0/55.2/41.7 in. Head/hip/leg room, r: 37.3/53.9/40.5 in. Cargo volume: 12.8 cu. ft.